Chocolate is one of the finer things in life. Its sweetness, richness and smooth texture titillate the taste buds. Listed below are the reasons that chocolate is considered to be so good for the skin. * The flavanols present in chocolate protects the skin from the damaging rays of the sun, keeps the skin hydrated and boosts the flow of blood. * The cacao seed extracts and the organic compounds such as flavanols and polyphenols make it a strong antioxidant. * Cocoa beans are packed with fatty acids including oleic acid, palmitic acid and stearic acid, which are nourishing for the skin and leave the skin soft and pampered. * Chocolate is a natural anti-inflammatory and is even used on sensitive and irritated skin to soothe it. * The cocoa in chocolate aids in the reduction of stress hormones which, in turn, lessens the breakdown of collagen in the skin. This helps in the prevention of wrinkle-forming and keeps the skin plump and youthful. * Cocoa is a source of manganese which is good at nutrient absorption. 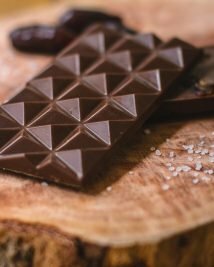 * Cocoa beans are rich in magnesium which helps the body to produce a hormone called progesterone that is ideal for dealing with stress-related breakouts. * Cocoa is also is rich in omega 6 fatty acids which are known to assist skin healing at the cellular level; one of the ways that it does this is that it helps in healing and reducing the appearance of scars. 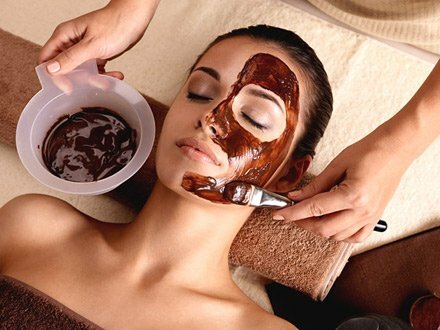 There are various products such as body scrubs, body butter and masks available in the market that you can use, but if you are feeling adventurous and want to make your own chocolate facial mask, the process is quite easy. To make this mask, you will need cocoa powder and heavy cream. Take one tablespoon each of heavy cream and cocoa powder and mix it well. Clean your face thoroughly and apply the mask. Leave the mask on for 15-20 minutes before washing it off. This mask is suitable for all face types and leaves your face soft and plump.